Nek0's Blog - Devlog: Progress with "Tracer"
Hi. This is the second post in my ongoing devlog for my game “Tracer”. About a month ago I posted my initial breakthrough, where I could build a floor of the building the player will be infiltrating. A lot changed since then. The floors still exist, but are not as colourful as they used to be. The floor is now uniformly white, because I have no proper texture for the floor, but I added some furniture. For now it’s just tables and some cardboard boxes, but there will be more. There is also sanity checking when placing furniture. Everything that needs to be accessed is reachable. I reworked the collision system, which used to be tile based. This was good for the beginning and easy to implement, but I soon realized, that I needed something more complex. So instead of checking if a tile can be walked upon, there are now boundaries within a tile, based upon the object existing on that tile, where the player can’t walk. This took me a whole lot of time getting it to work properly. I had several instances, where the player could glitch through walls under certain circumstances. My biggest breakthrough though I finished just today. I have laid the foundation for NPCs. 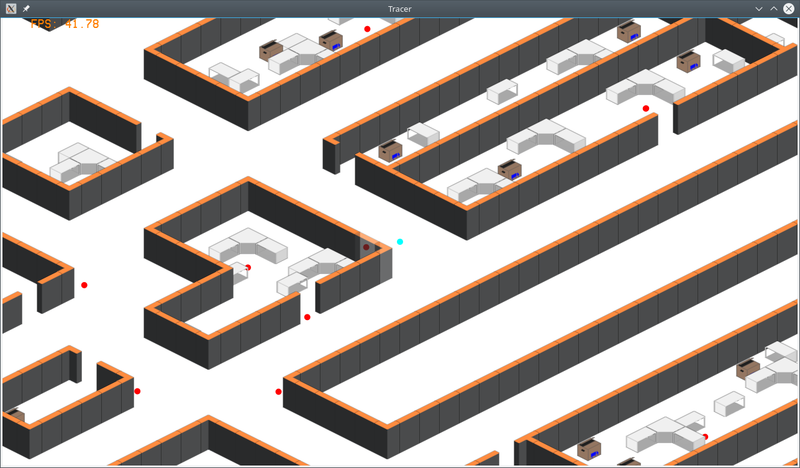 For now they don’t have any real appearance, they are just displayed as red dots (the player is also just a cyan coloured dot). For now they just walk around randomly between tables, where they stay some random time. Again I fell, that the Entity Component System is a very powerful tool here. I suspect that my former game projects failed partly because of the lack of this tool. Unfortunately you don’t get to see the dots moving on a still image, but you can get an impression.